It is important to learn how your heart works and how each of the valves function. When you understand the specifics of what your doctor or healthcare team is trying to evaluate and accomplish through treatment, you’ll be better equipped to help make great decisions. Any heart problem can seem overwhelming at first, but recovery statistics are very good for people who receive proper treatment. Many heart valve problems are first identified by the presence of a “murmur” or sound that can be heard when a healthcare provider listens to the heartbeat with a stethoscope. A murmur may sound like a “whooshing” noise of blood flowing under pressure as it moves from one chamber to the next, or it may sound like an extra click when a valve allows back flow. Some murmurs are harmless, and others can indicate an underlying problem with the valve. If you or your healthcare provider notice a murmur, here are some of the things he/she may be looking into further. The causes of valve problems can often be linked to birth abnormalities, related to age, or brought on by another condition. Degenerative valve disease — Most commonly affecting the mitral valve, over time valves can slowly degenerate. For example, mitral valve prolapse, a condition that affects 4–5 percent of the general population, may eventually turn into mitral valve regurgitation requiring treatment. Calcification due to aging — Sometimes calcium can accumulate on the heart’s valves, most commonly affecting the aortic valve, and can lead to aortic stenosis. These conditions can cause one or more of the heart valves to leak blood back into the heart chambers or fail to open fully, making your heart work harder and lessening its ability to pump blood. Although valve problems can potentially be severe and life-threatening, most valve conditions are also highly treatable. How would I know if I am having symptoms of valve disease? It’s important to know that some patients do not experience any symptoms, yet they can still have a valve problem that needs treatment. Some people suddenly experience very noticeable symptoms. Valve disease symptoms can also develop very quickly if the condition is severe. For some people, the disease progresses very slowly, and the heart is able to compensate over time so that the symptoms are barely noticeable. However, the risk and damage may still be significant, so education and awareness about the possible causes for a gradual onset of symptoms is important for patients who may be at risk. Symptoms do not necessarily determine the seriousness of a person’s valve problems. A valve problem can be severe with no symptoms. A valve problem can also be insignificant in terms of leakage, but problematic because of the uncomfortable symptoms. It is important to tell your healthcare provider any time you notice new or irregular symptoms that may relate to your condition. Download a Heart Symptom Tracker so that you can track your symptoms over time. A change in symptoms is important to discuss with your physician. People who have had rheumatic fever or a case of infective endocarditis are at greater risk for heart valve problems. Heart problems like a heart attack, heart failure, arrhythmia, or previous heart valve conditions from birth (called congenital heart defects) can also increase the likelihood for developing valve problems. Many people live long and healthy lives and never realize they have a mild valve problem. 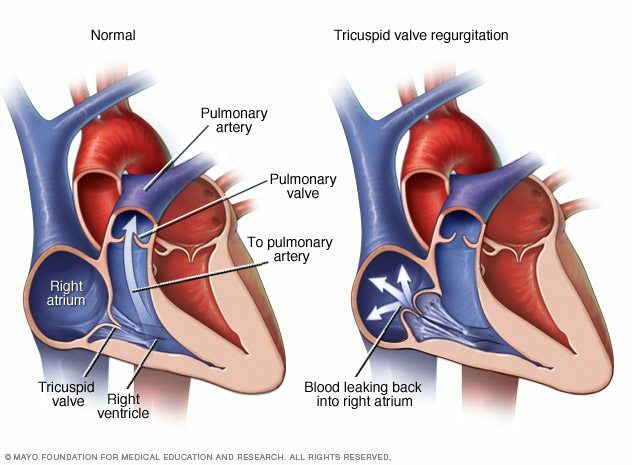 However, valve disease can seriously increase a persons’ risk for sudden death or cause rapid development of problems in and around the heart that can become fatal without treatment. Most valve conditions can’t be treated with medication alone. However, sometimes the problem is not severe enough to require surgical repair, but it is bothersome enough to cause symptoms or risks. In cases like these, a condition might be effectively managed for a while with medication. It depends. Until recently, the American Heart Association recommended giving antibiotics to prevent endocarditis to these patients before they had dental work. However, those guidelines have changed – the American Heart Association no longer recommends antibiotics before dental procedures, except for patients at the highest risk for bad outcomes from endocarditis. If a person has had heart valve surgery, but had not had a heart valve replaced, their cardiologist or surgeon will tell them if they need antibiotics. Read more about the antibiotic prophylaxis guidelines for infective endocarditis. How do medications help people with valve problems? People who are diagnosed with heart valve disease may be prescribed a medication to help relieve symptoms and decrease the risk of further problems. Although medications can serve a very important purpose, there is no medication that will stop a valve from leaking. Likewise, there is no medication that will open a valve that is too tightly constricted. Still, there are times when the medication is determined to be the best course of action. This decision may be most appropriate for someone whose valve condition is very mild or for a person for whom surgery is not an option. Medications cannot always protect the heart and the diseased valve may continue to damage the heart. Further actions may be needed. Your healthcare team can help you understand and evaluate options for heart valve repair or valve replacement surgery. Highly effective procedures are available for treating heart valve conditions. Some people find that medications are no longer needed within a few weeks after surgery.